How Safe Is Oregon From An Upset Against Stanford? With Alabama’s loss to Texas A&M last week, Kansas State and Oregon are the front runners to play in the national championship game. However, there is plenty of time for more upsets. With Stanford traveling to Eugene to play Oregon on Saturday night, how vulnerable are the Ducks? 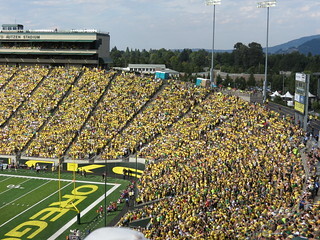 Our teams rankings predict that Oregon will win by 3 touchdowns at home. This differs only slightly from the Vegas line of 20.5. But lumping an entire team into a single rating does not tell the entire story. We have taken our team ranking algorithm and applied it to football specific statistics like yards per play. The result is rankings for offense and defense that account for strength of schedule. For Stanford, it separates an elite defense from an average offense. We also rank offense and defense for passing and rushing using yards per attempt. It’s most convenient to consume these results in match up visuals. Below, we show the results for Stanford at Oregon. Better defenses have a blue dot further to the right. When shown next to an opposing offense, the unit with the dot further to the right is predicted to have an advantage. These visuals let you instantly evaluate a game. Sports Illustrated used them in previewing Alabama and LSU two weeks ago in their November 5th issue. To learn more, click here. What do they say about Oregon’s chances of staying undefeated? Oregon’s offense scores so many points that head coach Chip Kelly often pulls his starters well before the end of the game. To account for this, we’ve combed through the play logs to identify drives in which the starters played. Through last week, we documented all the details in this post. For the blowout at California last weekend, we use plays until Oregon got the ball up 52-17 with 9:38 left in the 4th quarter. 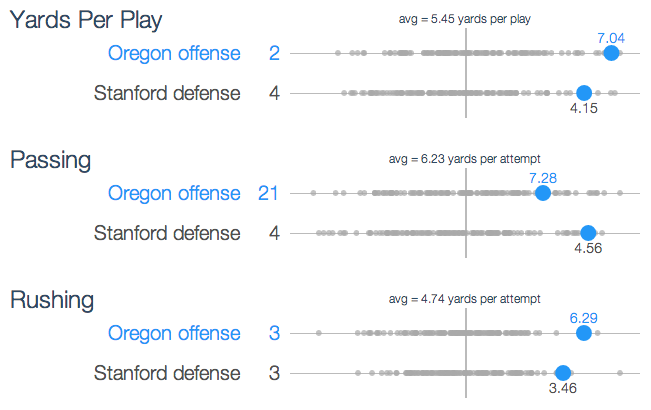 These adjustments bump up Oregon’s offense in all categories. However, it may be surprising that Oregon’s pass offense ranks 21st. The last two weeks, quarterback Marcus Mariota has had two brilliant performances against USC and California. When we consider all the drives that Mariota has played this season, Oregon has not had an elite passing game. But a freshman can certainly improve over the season. A stand out game against Stanford’s 4th ranked pass defense will even convince our algorithm. Can Stanford slow down the Ducks’ offense? They haven’t the last two years. But Stanford’s defense, led by linebackers Chase Thomas and Shane Skov, have made the leap to elite status this season. They must first slow down Oregon’s running game. Then they need to get pressure on Mariota when he drops back to throw. 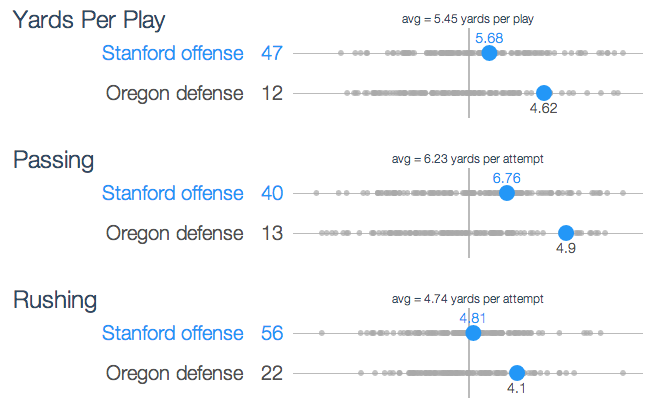 It’s a tall order, but Stanford has a better defense than any team Oregon has faced all year. The visual shows the average play of Stanford’s offense this season. However, these season long numbers do not distinguish between the quarterback play of a nervous Josh Nunes versus a speedy Kevin Hogan. Head coach David Shaw gave the reigns to Hogan two weeks ago against Colorado. Pass offense: 40th to 8th. Rush offense: 55th to 15th. Hogan has played against Colorado and Oregon State, the 112th and 30th ranked defenses by our numbers, the last two weeks. However, two games does not offer a lot of data. While Stanford’s offense has most likely improved with Hogan, it’s far from certain the Cardinal are the 11th best offense in the nation. Look for the offense to score points against an Oregon defense riddled with injuries on the line and the secondary. Our team rankings give Oregon an 87% chance to remain undefeated. But their injuries along the defensive line alone should worry Duck fans. The Vegas line started at 24 but dropped to 20.5. It might be a closer game than anyone expects. The sector hopes for more passionate writers such as you who aren’t afraid to say how they believe. Always follow your heart. Mostly I do not spot on blogs, but I’d prefer to say that this post actually forced me to do so! superb spot.